You may be able to handle a double major, but can your financial aid? Please help me out with a question. I am majoring in finance. I am thinking about pursuing a double-major in finance and real estate. I will have to take only 6 more classes than what I am supposed to take for my finance major. Will my financial aid cover the extra classes? — Jeffrey P. As noted in a previous Ask Kantro column, What types of student aid are available for a second Bachelor's degree?, the Pell Grant, Federal Supplemental Educational Opportunity Grant (FSEOG) and TEACH Grant are not available to students who have already received a Bachelor's degree. Students are considered to have earned a Bachelor's degree if they have completed all of the requirements for the degree, even if they have not yet received the diploma. In certain limited circumstances, students who are completing a State-required post-baccalaureate teacher certification program are still treated as though they were undergraduate students for federal student aid purposes. These students are eligible for the Pell Grant and the TEACH grant but not the FSEOG grant, and their Stafford loan eligibility is restricted to the undergraduate loan limits. Colleges have some discretion in deciding when a student has completed a Bachelor's degree program. Some colleges have more flexible policies than others, so it is worthwhile to ask the college for a copy of its written policies concerning financial aid eligibility for students who are seeking a double-major. Per the regulatory definition of undergraduate student at 34 CFR 668.2, a Bachelor's degree program is normally expected to take only four years. There are exceptions for certain majors that may take as long as five years. But if the degree program normally lasts six years (e.g., certain dual-degree programs that result in a graduate or professional degree in addition to a Bachelor's degree), the student is considered to be an undergraduate for only the first three or four years of the program. So college financial aid policies are less likely to be flexible about double-majors that take an extra year for completion of the second degree. The safest approach is for students who are double-majoring to avoid completing the last requirement for either major until their last semester of enrollment. That way the students can continue receiving financial aid until they are ready to graduate with both degrees simultaneously. It is important to review all of the college's policies concerning double-majors to make sure you are aware of all of the requirements. For example, the college might require students who are double-majoring to have accumulated a minimum number of additional credits beyond the requirements of the longer of the two majors. If you miscalculate, you might complete the requirements for only one of the two majors and have to take an additional class or two without financial aid for the second degree. 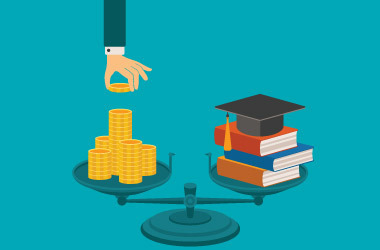 Retaining financial aid eligibility for a double-major requires careful planning.